The Active Learning Lab is available for all teachers to use, including regular classrooms, learning support classrooms, speech therapy, occupational therapy, and counseling. They can incorporate movement into their curriculum and instruction on a regular basis. 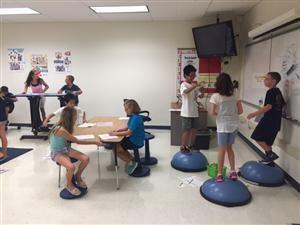 There are three sets of kinesthetic desks- strider desk, kneel-and-spin desk, and bicycling desk. 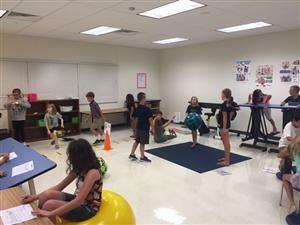 There are also stability balls, balance disks, resistance bands, a ladder to jump across, and a variety of other activities to help activate the brain for learning.